Graphic that says "The TN Quarterly Business and Economic Indicators, Tennessee Secretary of State Tre Hargett, The University of Tennessee Knoxville, Boyd Center for Business & Economic Research"
Tennessee's economy has consistently grown for five straight years, according to a report released Thursday by the Secretary of State's office. There were 8,898 new entity filings in the third quarter, which represents a 7.3 percent increase over the third quarter of 2015. This marks the 20th consecutive quarter of positive year-over-year growth. As of Oct. 1, there were 241,619 active entities in Tennessee, representing a 5.2 percent increase over last year's third quarter count. "We've seen this trend for quite some time, but reaching five years of continuous growth highlights why having the right leadership can make the Volunteer State a premier destination for businesses and industries from across the globe," said Tennessee Secretary of State Tre Hargett. 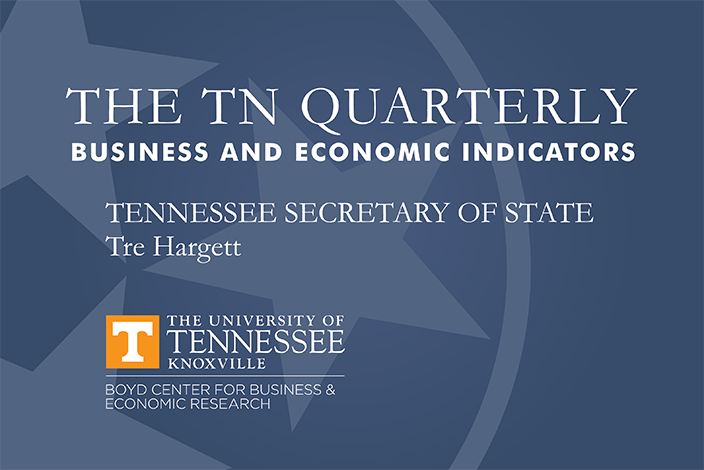 The Tennessee Quarterly Business and Economic Indicators report is created to provide a periodic snapshot of the state’s economy based on a variety of information, including new business data from the Division of Business Services. It’s published through a partnership with Secretary of State Tre Hargett and the University of Tennessee Knoxville’s Boyd Center for Business and Economic Research. "New entity filings have risen for a very impressive five straight years, evidencing a very solid Tennessee economy and signaling that more growth is expected through 2017," said Dr. William F. Fox, Director of the Boyd Center for Business and Economic Research. Domestic limited liability corporations (LLCs) account for more than half of all new entity filings, growing 10.8 percent over the third quarter last year. Davidson County again led the way with the most initial filings among the state’s four largest counties with 2,140. Shelby County had 1,594 followed by Knox with 734 and Hamilton at 648. The four counties account for 5,116 new entity filings during the third quarter, which is an astonishing 45.9 percent increase over the same time last year. The state’s unemployment rate increased in September to 4.6 percent up 0.2 percentage points from the previous month, but still well below the national rate of 4.9 percent. The national economy accelerated in the third quarter thanks to growth in jobs, housing and vehicle sales.